Three striking formations of coastal Marlborough are shown in this image. In the foreground are the White Bluffs/Te Parinui o Whiti, historically a dividing line between Ngāi Tahu and tribes to the north. 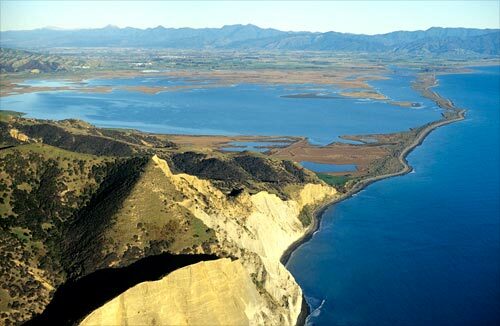 In the middle distance is the largest of the Wairau (or Vernon) lagoons, which are part of the estuary of the Wairau River, and to its right is the boulder bank, which separates the lagoons from Cloudy Bay. At the boulder bank’s north end (at top in this image) is the site of the Wairau Bar archaeological excavations, which uncovered human and other remains, probably dating from the 13th century. The Robertson Range, which flanks Port Underwood and the Tuamarina valley, is in the distance.